Stamping is an extremely versatile craft that is rapidly increasing in popularity within the world of paper crafting. It's the same concept as block printing on fabrics that we are accustomed to since ages. Paper, however is the foundation from which the art of stamping emerged. It is the process of creating intricate artwork for cards, scrapbooks, journals and mixed media projects. Besides paper, stamping can be applied on mediums such as fabric, metal, wood and glass. 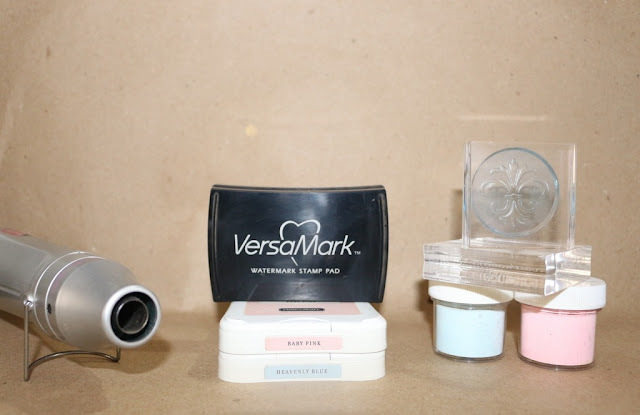 While it is possible to create lovely images with just a few basic equipment, there is a wealth of different stamps, inks, markers, pencils, embossing powders and other great supplies available in the market that can tempt a novice stamper. For the very beginning paper crafter stamping may seem like a simple enough topic, but to master this art you will have to go beyond the basics. So let's begin with learning all the tools of the trade! This is pretty much the most basic thing you'll need to get started with stamping your projects! You can choose between traditional wood backed rubber stamps or modern clear acrylic stamps or a combination of both. 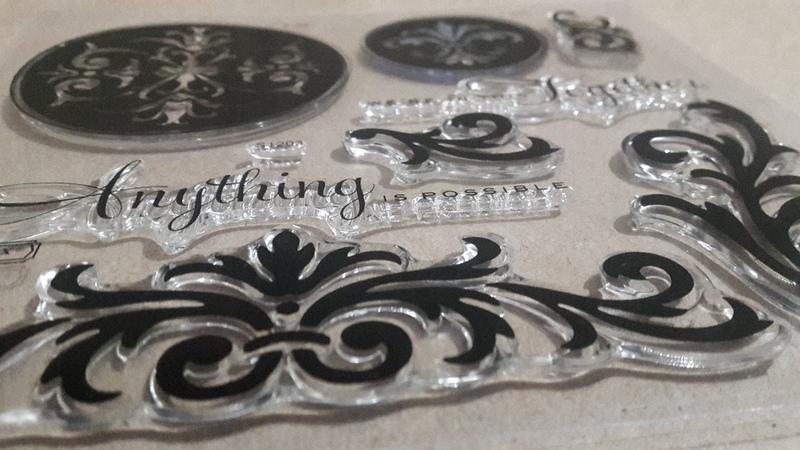 The clear acrylic stamps are transparent and temporarily clinged to acrylic blocks making the placement of stamps simple, precise and straightforward. Whereas, the rubber stamps are opaque and come either mounted on a permanent wooden block or unmounted with an option to cling it temporarily on clear or wooden blocks. If you choose to go with clear acrylic stamps or unmounted rubber stamps, you will need some acrylic blocks to mount your stamps. They are sold separately from stamps and are available in a variety of sizes to accommodate different stamps. For a perfect stamping experience choose an acrylic block that is slightly larger than your stamp but not too big which leads to stray ink marks. 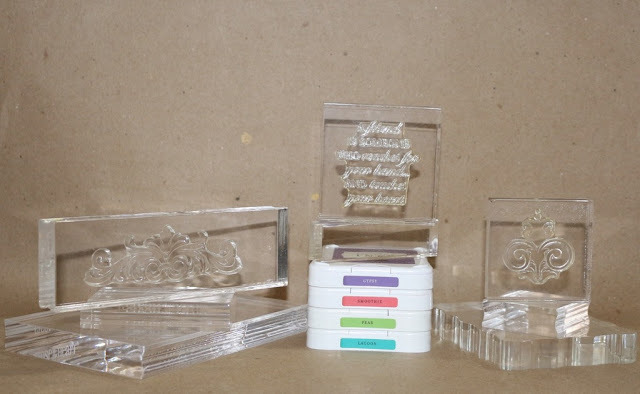 The most commonly used acrylic blocks are 2" x 6", 2" x 2", 4" x 4" and 4" x 6". The process of stamping is incomplete without an ink pad. 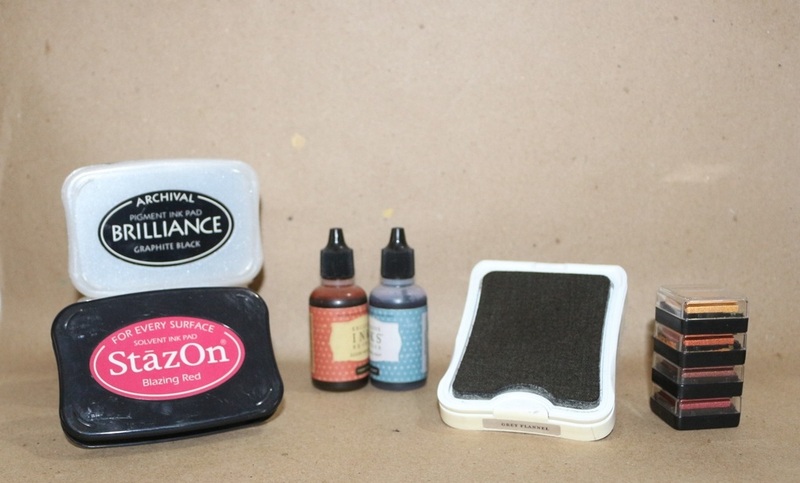 The selection of ink pads depends mainly on the type of medium used for your project i.e. fabric, paper, plastic, metal etc. Paper is a porous material and so any dye based inks will work perfectly with paper. However for non-porous surfaces like plastic or metal you will require pigment based inks. There are also re-inkers available in a variety of colors that can take your stamping to a whole new level. Art dabbers or sponges are perfect to use with your inks to give your projects a distressed look. A blending tool is a must-to-have if you want to give your projects a multi-shade or water-coloring effect. Another must-have supplies for all stampers is papers that come in a variety of colors, patterns, shapes, textures, weights and sizes. You can stamp on pretty much any kind of paper - cardstock, pattern paper, vellum, glossy paper or specialty paper. 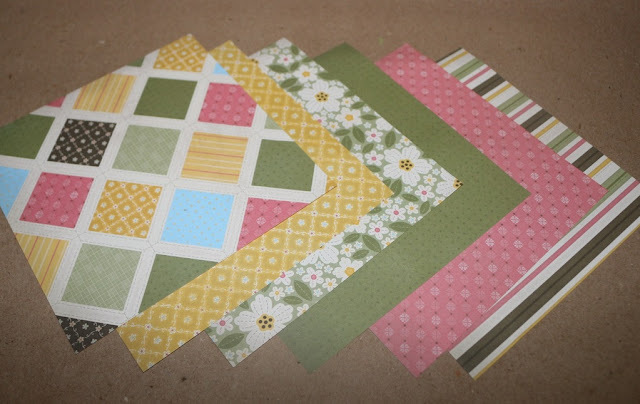 The most commonly used papers for cardmaking and scrapbooking projects are cardstock (cardsheet) and pattern paper. You will most commonly find paper in sizes - 8 x 11 inches, 12 x 12 inches or 20 x 30 inches. 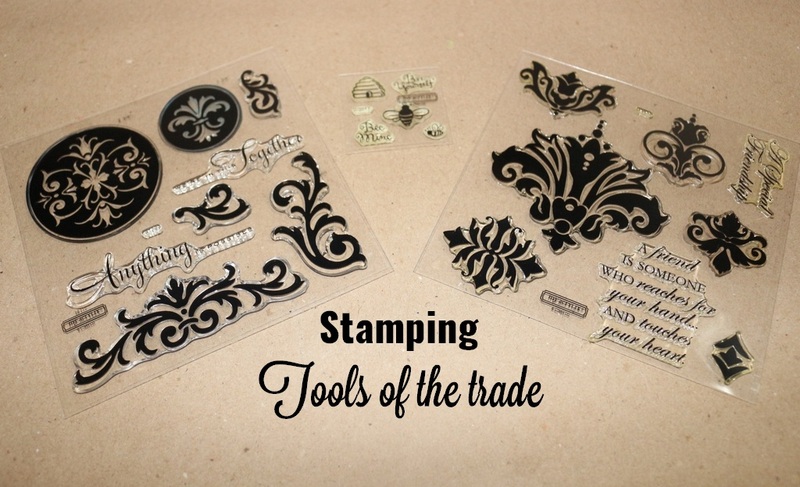 It is important to stock up on different types of papers for a variety of stamping projects. A stamping (foam) mat is an absolute must-have to get a crisp and clear impression on your paper. For an intricate paper cutting of your stamped impression, it is important to have a pair of super fine detail scissors in your collection. A sharp craft knife is an essential tool to give dimension to your stamped impression by raising a part of the image. 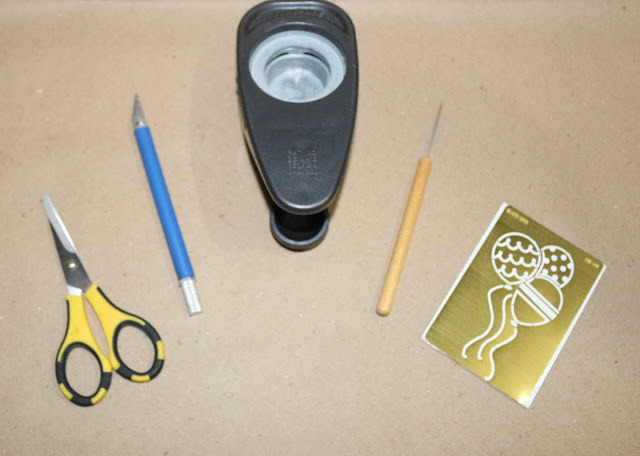 Some other common crafting tools like paper trimmer, scoring board, bone folder, paper piercer, edge distresser and sandpaper are also useful for creating beautiful stamped artwork. For an avid stamper, paper punches, die cuts and stencils add a lot of great shapes and cutouts to your projects. Again when it comes to adhesive, there are plenty of options available to pick from. You could however, get away with three basic types - a tape runner (double sided tape), a glue pen and clear adhesive dots. To give your projects a three dimensional effect you can invest in some foam tapes and dots that are available in various widths, shapes and sizes. Paper glaze is another good to have adhesive to give a clear glass like finish to your projects. Once the impression is inked, you will probably want to color it. There are a plethora of coloring supplies available in the market - chalks, pens, pencils, markers, paints, etc. 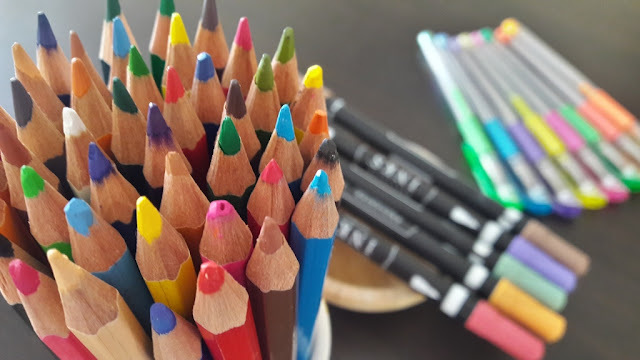 A few of the coloring tools like blender pens, sponge dabbers, waterbrush, etc are also required for achieving unique color effects on your stamped projects. If you have just started stamping, you can do away with just a few of these coloring tools and supplies. However if you are a seasoned crafter and want to take your stamping to the next level then there is a whole spectrum of coloring tools and supplies that you can explore to give your project an entirely unique look. Embossing is a stamping technique that gives your stamped image a slightly dimensional and raised effect. For embossing a stamped image, you will need a heat gun, versamark ink pad and embossing powders in a variety of colors and types. To avoid accidents while using the heat gun, it is important to use heat resistant surface like cookie sheet that is used to hold large pieces of paper and tweezers or tongs that is used to hold small pieces of paper. 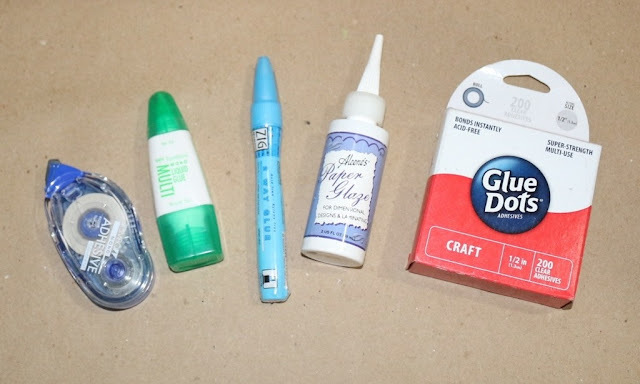 With these tools and some embossing techniques that we will be showing you in our upcoming Stamp & Create videos, you can create interesting coloring effects on paper and even add sparkle to your projects.